His Holiness Mar Dinkha IV, Catholicos-Patriarch of the Assyrian Church of the East, came to Rome from 1-4 October to meet His Holiness Pope Francis. His Holiness Mar Dinkha IV arrived with his delegation on Wednesday 1 October. On Wednesday evening a dinner was hosted by His Eminence Cardinal Koch in honour of the Patriarch. On Thursday morning 2 October, there was the private meeting of His Holiness Mar Dinkha with the Holy Father, followed by the meeting of the delegation with the Holy Father, comprising speeches, an exchange of gifts and a group photo. 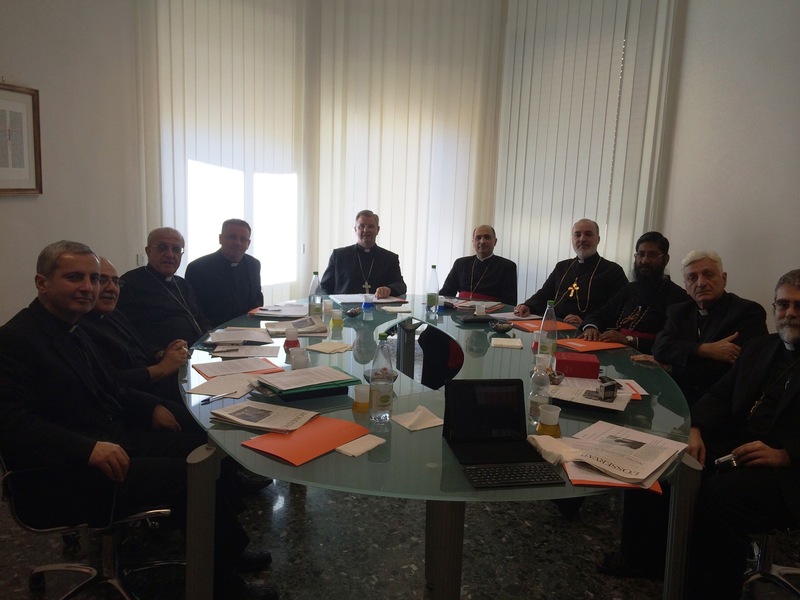 On Thursday afternoon and Friday morning two meetings were held at the office of the Pontifical Council for Promoting Christian Unity. The members of the delegation of the Assyrian Church of the East were His Beatitude Mar Meelis Zaia, Metropolitan of Australia, New Zealand and Lebanon, His Grace Mar Awa Royel, Bishop of California and Secretary of the Holy Synod, His Grace Mar Yohannan Yousif, Auxiliary Bishop of India, Very Rev. Archdeacon William Toma and Very Rev. Cor-bishop George Toma. The Catholic Church was represented by His Eminence Cardinal Koch (President, PCPCU); His Excellency Johan Bonny, Bishop of Antwerp, His Excellency Antoine Audo, Bishop of Aleppo of the Chaldeans, His Excellency Yousif Thomas Mirkis, O.P, Archbishop of Kirkuk of the Chaldeans, His Excellency Francis Kalabat, Bishop of Saint Thomas of the Chaldeans (Detroit, USA) and Rev. Gabriel Quicke (Official, PCPCU). The meeting at the Pontifical Council commenced with a word of welcome by His Eminence Cardinal Koch and words of gratitude by the Patriarch. Bishop Johan Bonny gave a short presentation of the history of the dialogue between the Catholic Church and the Assyrian Church of the East. The meeting reflected on the second phase of the dialogue dealing with the text on ‘Sacramental life’ with a view to ensuring its continuity and to preparing the signing of this document. There was also discussion on defining a methodology, and preparing an outline of the third phase of the dialogue on the nature and constitution of the Church. Both delegations want to continue along the path of dialogue and look forward to the next meeting.